Sometimes you have to make do with a kitchen that is hardly more than the inside of a food truck. If you or someone you know is interested in getting more out of the little galley you call home, be sure to check out these tips from Callie Little for Zillow. 1. Donate first: Before moving into your new space, make sure to get rid of all those things you don’t need anymore. 2. Think vertically: Vertical storage is a tried-and-true method of using space, and the kitchen holds some unique opportunities for making the most of it. 3. Find beautiful cleaning tools: Skip the plastic and get yourself a classic wooden broom, natural fiber dish brush and a glass soap dispenser. 4. 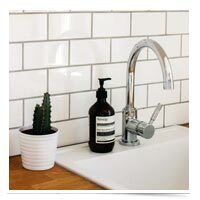 Tap into change: Installing a quality faucet with a pull-down sprayer can make your chores less of a chore. 5. Live the island life: Whether you choose a larger center-of-the-room-style piece or a small butcher-block number, these additions create more counter space and storage, all in one piece. 6. Light it up: Tailor your lighting to the energy you want in your kitchen. 7. Wallpaper accent: Finding a large-scale print will make the space feel larger, and layering a sizable mirror on top will maximize the look and any light. 8. Curate unique displays: One of the best ways to keep an assortment of oddly shaped kitchen items is to dedicate either one section of the room (think: the top 12 inches of the walls) or one wall to showing them off. 9. Keep it alive: Every room deserves a plant.